Violence/ Scariness: Cartoon-style peril and violence including slaughterhouse and bullfights. I warn you — a “however” is coming, maybe more than one. 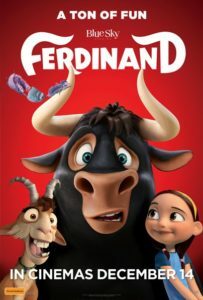 There’s a lot to like in “Ferdinand,” an affectionate version of the book by Munro Leaf about Ferdinand, the bull who did not want to fight; he just wanted to smell the flowers. WWE star John Cena provides a warm, inviting voice for the title character, and Kate McKinnon steals the show as his “calming goat.” The artwork is imaginative and colorful. However, the slight story of the book has been expanded to fill out a feature, and some of the choices are worse than just padding; they are misguided, distracting, even disturbing, especially for the youngest viewers. Leaf’s original story and the lovely Oscar-winning 1938 Disney animated short are beautifully simple. While most bulls are ferocious and proud to fight matadors, Ferdinand is a gentle soul who just wants to sit under a cork tree and smell the flowers. The men who are looking for the fiercest bull of all arrive just as Ferdinand reacts to being stung by a bee. Mistakenly believing that he is a powerfully furious animal, they bring him to the bullring, where he refuses to fight. The Disney film is eight minutes long and tells the entire story. This version, from Blue Sky, gives us a meandering tale about Ferdinand, bred in a facility that supplies bulls for bullfighters. As a young calf, he is bullied by the others, especially the alpha bull, Valiente, who suffers from what me might term bovine toxic masculinity. Ferdinand adores his kind-hearted father (Jeremy Sisto), asking him, “Can I be a champ without fighting?” “I wish the world worked that way for you,” his father says before he leaves for the ring. He never returns home. Ferdinand runs away and finds a perfect home, a flower farm. He is adopted by Nina, who is so devoted to him that she has him cuddle on the sofa next to her and sleep in her bed, even after he grows to the size of an SUV. After an adventure that includes a cleverly-constructed scene in yes, a china shop, Ferdinand ends up back at the ranch, where Lupe (McKinnon), his calming goat, declares that she will be his coach for outsmarting the matador. Ferdinand learns that the only options for the bulls are the ring or the slaughterhouse. He must rescue two of the bulls who taunted him before they are turned into hamburger, and then find a way to survive the bullring. McKinnon has the same lighting-fast fluidity of mood and character that made Robin Williams an ideal choice to provide the voice for the genie in “Aladdin.” She is in constant conversation with her many selves, and it is hilarious. However. The palpable padding of the storyline would not be a serious problem except for the misjudgment about the presentation of the fatal options available to the bulls. It is impossible, even for a child, to watch the rescue from the slaughterhouse without recognizing what all of those scary-awful machines are designed to do. Parents who do not want to answer some tough questions about dinner — or reconcile themselves to a vegetarian menu — should stick with the Disney version. Parents should know that this movie has peril and violence, including low-key depictions of a slaughterhouse and a bullfight, as well as some schoolyard language and potty humor. Family discussion: Why were the other bulls mean to Ferdinand? Why were the horses mean? Why did Ferdinand want to rescue bulls who were mean to him? One of Agatha Christie’s most beloved mysteries has returned to the screen with another all-star remake of “Murder on the Orient Express,” this time starring Sir Kenneth Branagh, who also directed, as the brilliant Belgian detective Hercule Poirot. It does not have the lush glamour of the 1974 original, directed by Sidney Lumet, and the tone is uneven, but the tricky puzzle is still fun to try to solve, for those who have not read the book or seen the earlier film, and the international cast makes it entertaining. When he says he is going to take a nice long train ride and relax with a book by Dickens, we know he will soon be solving another mystery. As his friend, a handsome but louche train company official, says, a train combines three things: boredom, anonymity, and a gentle rocking motion, and that can lead to all kinds of fascinating possibilities. Of course, in order to have a mystery, we have to have suspects and clues, so much of the film is taken up with introducing us to the cast of characters, a very international group, as one might expect on a train from Istanbul to Paris. It includes a friendly governess (“Star Wars'” Daisy Ridley as Mary Debenham), a British doctor of African heritage (“Hamilton’s” Leslie Odom Jr. as Dr. Arbuthnot), a professor (Willem Dafoe), an elderly countess (Dame Judi Dench), an Italian-American car dealer (Manuel Garcia-Rulfo), and a shy missionary (Penelope Cruz). Some additions to the storyline are more distracting than illuminating. More seriously, they take away from our chance to get to know the very large cast of characters and that takes away from the sense of mystery and the stakes of the outcome. Shifts in tone give the film a disquieting inconsistency and flashy camera moves, like an extended shot looking down at the characters’ heads, serve no purpose except to make us wonder what they are supposed to be doing. Poirot is famously proud of his mustache, and so any depiction of the character must have some impressive facial hair. Branagh’s is close to farcical, making us wonder whether it merited or required its own trailer on set. One thing we know about Christie and her famous creations — they always knew exactly where they wanted us to be. This movie does not. Parents should know that this film contains peril and violence including murder, references to kidnapping and murder of a child, suicide, miscarriage, gun, knife, scuffle, drinking, smoking, drugs, sexual references including prostitute, some racist comments, and some mild language. Family discussion: Did Poirot make the right choice? What were the most important clues? What can you learn from him about observing significant details? Writer/director Sofia Coppola has taken a 1971 Clint Eastwood movie about a wounded but manipulative Civil War soldier cared for and disruptive of the staff and students of a small girls’ school and reframed it as a story about the staff and students of a small girls’ school who care for and are disrupted by a wounded Civil War soldier. It is not so much telling the story of the spider and the fly from the perspective of the fly; it is more like telling the story with the women as the spider. From her first film, “The Virgin Suicides,” through “Marie Antoinette,” “The Bling Ring,” “Lost in Translation,” and “Somewhere,” Sofia Coppola has been transfixed by stories of slender, ethereal young women who are a bit lost in a world created by powerful but inadequate men, and she has done her best to transfix the audience as well. 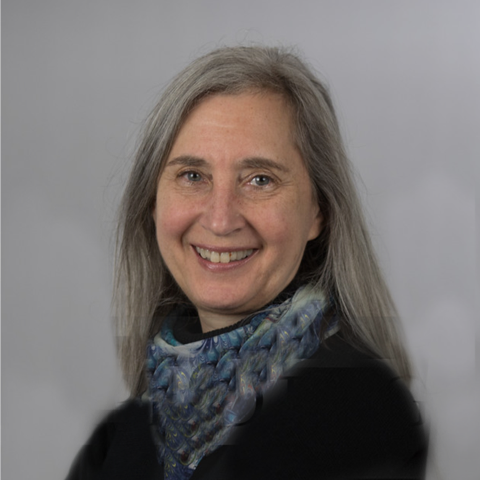 Her next project, “La Traviata,” the story of a consumptive courtesan who turns out to be more noble than the man she loves, is certain to fit this pattern as well. It is impossible to consider this latest work, a remake of a film directed by and starring two of the most testosteronic filmmakers in movie history, without that context. And that context is increasingly repetitive, with each iteration revealing not only the limits of the individual film but also the lacunae of the previous ones as well. What once seemed intriguing, mysterious, and thoughtful now appears, when the work is viewed as a whole, as superficial. It turns out that what was omitted was not because it was subtle and deep but because she had nothing more to say. While this film touches on issues of war (and warring emotions), it eliminates the slave character played in the first film by Mae Mercer, because there is really no way to do that relationship justice and any attempt to do so would throw the rest of the story off balance. It is a pity, because she is just so good with the externals. The settings, costumes, music, and performances in her films are always superb, which makes the dispiriting emptiness even more disappointing. Martha Farnsworth (Nicole Kidman) runs a small boarding school for girls, a retreat precariously close to Civil War battles being fought nearby. When one of the girls is out gathering mushrooms in the woods, she discovers a wounded Union soldier, John McBurney (Colin Farrell) and she brings him back to the school for treatment. Miss Farnsworth is not pleased, but she cannot turn him away. She treats him and tries to keep his presence as a male and an enemy combatant from disrupting the students and her co-teacher, Edwina Dabney (Kirsten Dunst). But he is a novelty and a distraction especially for those who long, perhaps unaware how much, for male attention. 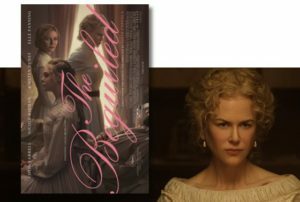 McBurney has a gift for making each female in the house feel that he is what they most want him to be, from the teenager (Elle Fanning) to the widow (Dunst). “I’m grateful to be your prisoner,” he says. At first, he is gracious, unassuming, and charming. But he becomes a more ominous presence, dividing and disrupting the women until they take drastic action. Kidman and Dunst are outstanding, representing two very different reactions to the intruder. It is precisely presented, even beguiling, but Coppola needs to move on or go deeper. Parents should know that this film contains peril and violence including war (mostly offscreen), a wounded soldier, an accident, amateur surgery, mutilation, and murder, as well as sexual references and a situation, alcohol, and some strong language. Family discussion: How did McBurney assess the vulnerabilities of each of the women and girls? How does this version reflect our era in differing from the original? Disney has almost all of the Marvel superheroes. Warner Brothers has DC superheroes. 20th Century Fox has the Fantastic Four and perhaps someday will make a movie worthy of them. And so Universal wanted its own universe of supernatural characters. It does not have the rights to any superheroes, but it does have the monsters, including Mr. and Mrs. Frankenstein’s monsters, Wolfman, Dr. Jekyll and Mr. Hyde, the Invisible Man, the Creature from the Black Lagoon, and the Mummy. This film is the first in a planned series of high profile, high-budget, interlocking stories featuring big stars, big stunts, and big special effects, set in what Universal has dubbed The Dark Universe. So, get ready for an Avengers/Justice League-style series of partnerships, cross-overs, and mash-ups. 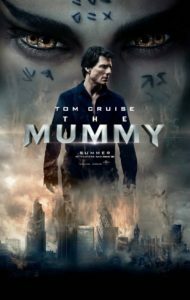 We begin with “The Mummy,” possibly because the dashing Brendan Fraser updates starting in 1999 have made the story more familiar to 21st century audiences. Of course, those films were inspired by the Boris Karloff classic. 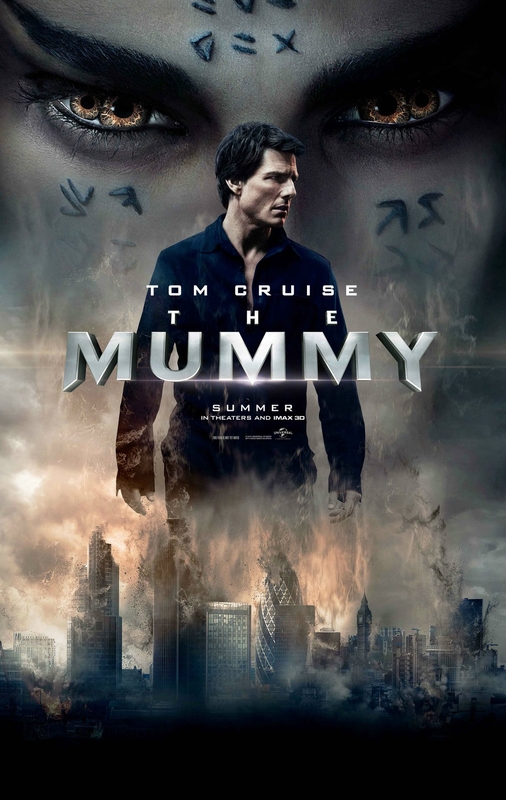 This reboot retains very little from either beyond the idea of a deadly mummy from ancient Egypt. This mummy is female. Her name is Ahmanet and she is played with feral ferocity by the very limber Sofia Boutella of “Star Trek: Beyond.” She was once in line to become ruler of the kingdom of ancient Egypt and be worshipped as a god. But when her father had a son, he became heir to the throne. Enraged, she murdered her father and the boy and his mother and traded her soul for power of life and death. She could not die, but she could be stopped with an elaborate mercury solution, and so she had been in a tomb in Mesopotamia (now Iraq) for thousands of years until American soldier and tomb raider Nick Morton (Tom Cruise) and his quippy sidekick Chris (Jake Johnson) come along to release her and her curse on the world. With them is beautiful blond archeologist Jenny Halsey (Annabelle Wallis of “Peaky Blinders”), along for exposition, retro rescuing, and some tiresome banter about a one-night stand with Nick. Russell Crowe shows up as well, as a doctor who is obsessed with evil, though whether for it or against it is not entirely clear. To say more would be to spoil one of the film’s best ideas. The real stars of the film are the stunts and special effects, which are great. Adrenalin junkie Cruise clearly has a blast racing ahead of, well, blasts, in the battle scenes, and, later, zombies as well. A plane crash scene is viscerally exciting, and sets up the movie’s funniest line later on. But it cannot make its mind up whether it wants to be a high-concept adventure, a horror movie, or a campy comedy (zombie Jake Johnson continues to be quippy). And Cruise is simply miscast. He is too old for the part of yet another of his callow cases of endearing arrested development. It is one thing for a guy in his 20’s to joke about a one-night stand; it is uncomfortably skeevy for a guy, however handsome and eternally young (and still able to run very fast) in his 50’s. By the time we see where this character is going in the movie’s final scenes, it is clear that this should have been the first act, not the last, and that this Dark Universe thing is going to be a long slog indeed. Family discussion: Was Nick telling the truth about the parachute? What made him change his mind about Jenny?